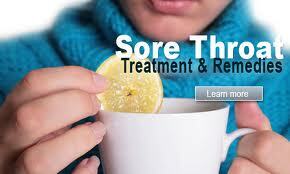 Sore throat is one of the possible outcomes of common cold and flu. The pharynx or the back part of the throat becomes inflamed due to any viral or bacterial infection. The streptococcus bacteria are generally responsible for the Strep throat condition. Children are the worst sufferers of sore throat as they are more vulnerable to viral infections with the teenagers in the following. Adults also experience this problem but in lesser number. 1. Severe pain in the throat followed by frequent coughing. 2. Inability to swallow food. 5. Fever followed with chills. 1. Viral and bacterial infection as in common cold. 2. Tonsillitis, influenza, sinusitis, measles, diphtheria, mumps etc. diseases. 4. Leukemia in rare cases. Sore throat, in most of the cases does not pose any serious ailments and the home remedies are the best methods to treat this condition. Although, conventional antibiotics are usually administered in acute throat pain conditions, still the natural modes of treatment always come as the first choice. 1. Gargling is considered as the best remedy for sore throat. Gargling of the throat with lukewarm water adding 2 tablespoons of common salt reduces the pain quickly. But this should be carried 4-5 times a day. 2. Sipping a mixture of cinnamon powder, pepper powder along with a teaspoonful of honey in a glass of lukewarm water is very effective in reducing the throat pain. 3. Ginger is widely used in treating the soreness of the throat. Ginger, taken as ginger tea or ginger juice taken with little honey is equally effective in this treatment. 4. Gargling with a decoction of fenugreek seeds also produces beneficial results. 5. Decoction of henna leaves is also effective in reducing the soreness of the throat. 6. External application of the crushed betel leaves on the throat provides relief from the pain. In severe cases crushed berry plant also produces the desired effect. 7. Extract from the bark of mango tree is highly effective in treating sore throat. A teaspoonful of the extract is added to a glass of lukewarm water and used for gargling. 8. Use of Basil leaves is quite popular in treating various throat problems. A decoction can be prepared by boiling 10-15 basil leaves in a glass of water. To avail best results this decoction should be taken several times a day in small sips. Few drops of honey can be added to sweeten the drink. Read more effective Home Remedies for Sore Throat. Also know useful Home Remedies for Cough.